The event that takes place September 10th at World Harvest Outreach Church will feature headliners like Tamela Mann, Pastor Shirley Caesar, Kim Burrell and Tasha Page Lockhart. The who’s who list will also include rising stars Anita Wilson, Kathy Taylor, and Lisa Knowles. The all women cast is looking forward to worshipping with all those affected and displaced by Houston flooding. J. Spivey Productions has told PATH that two random people in attendance will get their electricity bills paid, and a significant amount of the proceeds will be donated to two different charitable organizations. Doors open at 4pm and show begins at 5pm. World Harvest Outreach Church is located at 10800 Scott St., Houston, TX 77047. 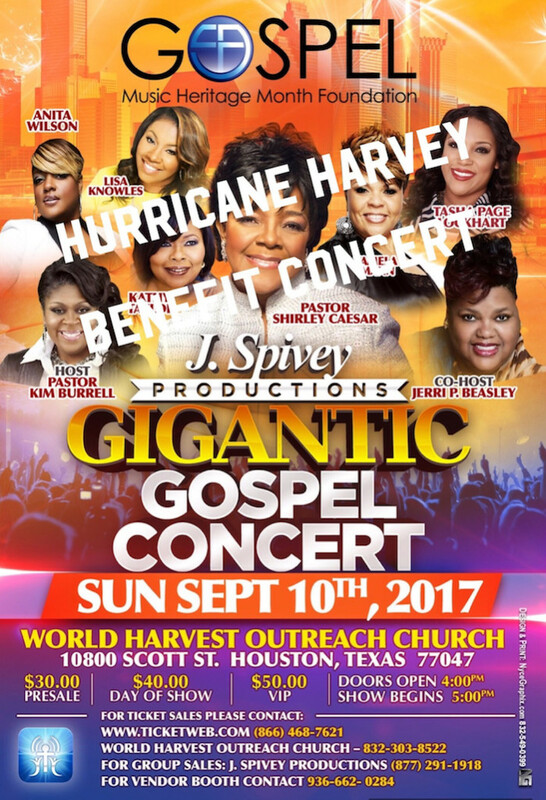 This entry was posted in Gospel, Reviews and tagged Benefit concert, Dallas, Flyer, Gigantic Gospel Concert, Houston, J. Spivey Productions, Kim Burrell and Tasha Page Lockhart, Pastor Shirley Caesar, Tamela Mann by Kris Patrick. Bookmark the permalink.